I am really fascinated by whales and dolphins, so today I am writing about an amazing species called the dwarf sperm whale. These guys only grow up to 2.7 metres long, making them the smallest species of whale in the world and smaller than some of the largest dolphins. Dwarf sperm whales are able to store large amounts of poo in their bum, which they eject into the water when they feel threatened to distract potential predators. They usually swim alone and feed on squid and crabs. At breeding time, the females are pregnant for 9-11 months and the calves are 1 metre long at birth. 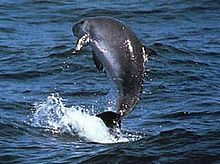 Dwarf sperm whales are found in the deep waters of the Atlantic, Pacific and Indian Oceans and are very rarely spotted at sea. Are there any other interesting facts that you would like to share about dwarf sperm whales?